Spring is a wonderful time of year. Birds are chirping; flowers are blooming. And while those flowers are beautiful, they also mean the air is FULL of pollen. If you don’t have a pollen allergy, consider yourself lucky. There are, however, many other allergens that could be itching your eyes this spring. The most common allergens in New Jersey are tree pollen, mold, ragweed, grass, and weeds. The levels of pollen vary year to year, and even day to day. That’s why you have to work to prevent allergies before they start. Prevention and limited exposure are the best ways to avoid severe allergies this spring. 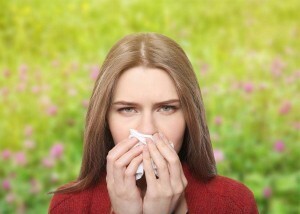 Here are a few steps you can take to fight allergies this spring! An air purifying system not only keeps allergens from coming into your home’s air, it cleans and humidifies your air. A whole-home air purifying system helps remove pollen and allergens you bring into your home. It also works to help kill mold and bacteria inside your HVAC system to give you family the cleanest possible air. UV Lamps also help kill mold and bacteria that made their way onto your air conditioning coils. The fresher your air is inside, the less time you send exposed to potential allergens. Your family deserves the cleanest possible air. Consider installing a whole-home air purifying system today. Ensure your family has the freshest air this allergy season. Call us, TODAY.